So you’ve picked your favourite from all the jazzy skateboards and have got the hang of the general method of riding, what next? The first trick most people move on to is almost always the ‘Ollie’. It is the foundation of the majority of other skateboarding tricks and if you get a handle on that one then you’ll find it much easier when you move on to the more complicated stuff. But how do you produce the perfect Ollie? The first phase is getting the correct stance. 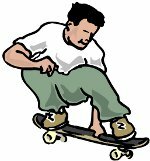 The ball of your back foot should be on the tail of the skateboard with your front just behind the front trucks. This is also slightly based on the comfort of the rider so feel free to adapt slightly depending on your personal preference. From there you need to bend your knees and slam your back foot down as hard as possible. The harder you slam, the higher you go. At this point you need to jump up from your back foot as well and raise your body into the air. This is a motion that will take some practice but is the key to a good Ollie. This phase is called the ‘the pop’- timing is everything. So what’s your front foot doing while this is going on? It is basically your steering wheel – it is used to guide the skateboard where you want it to go. Really all you need to do is drag the side of your foot up the board; this guides the board where you want it to go as well as pulling it up slightly more using the grip tape on the board itself. Again, it will take time to get the hang of but will come naturally with time. Once in the air, you need to level the skateboard out. After you’ve jumped you should pull your knees up to your chest and get into a (floating) crouch position. As you’ve reached the maximum height of your jump and you feel yourself starting to drop you need to think about levelling out the board. This is done by getting both feet level on top of the board as you come back down to earth and ensuring the board lands flat. Now’s the tough part. Many people can get in the air and flick the board up but struggle when it comes to landing back down with the board in control. The key is getting the skateboard straight in the air and then really bending your knees as you land. This will give you better control and also minimise the possibility of any unwanted injuries. And then all that’s left to do is roll away and soak up the glory of the perfect Ollie! It will certainly take some time to master, but persevere and follow these tips and you’ll end up with a great foundation to become a top class skateboarder capable of producing every trick in the book! Article courtesy of Skate Hut, where you will find products to meet all your skating needs. They stock an extensive range of action sports equipment ranging from skateboards to ice skates and everything in between. The Skate Hut caters for all, with skateboards and accessories for all ages and abilities.